Errr... Looks like yellow isn't moving this turn. The spite factor isn't huge, but it is there in Downforce. Racing day. There’s nothing like the adrenaline born from hearing the roar of engines and gripping the steering wheel with white knuckles. Except for you, as owner of a racing team, you’ve got a bird’s-eye view of the race, and hopefully with the right tactics, you can advance your interests without helping others too much. And a little side betting might even sway your allegiances. Even with the clear-eyed perspective that experience can bring, you know that anything can happen once the rubber meets the road. So you’d better buckle up. 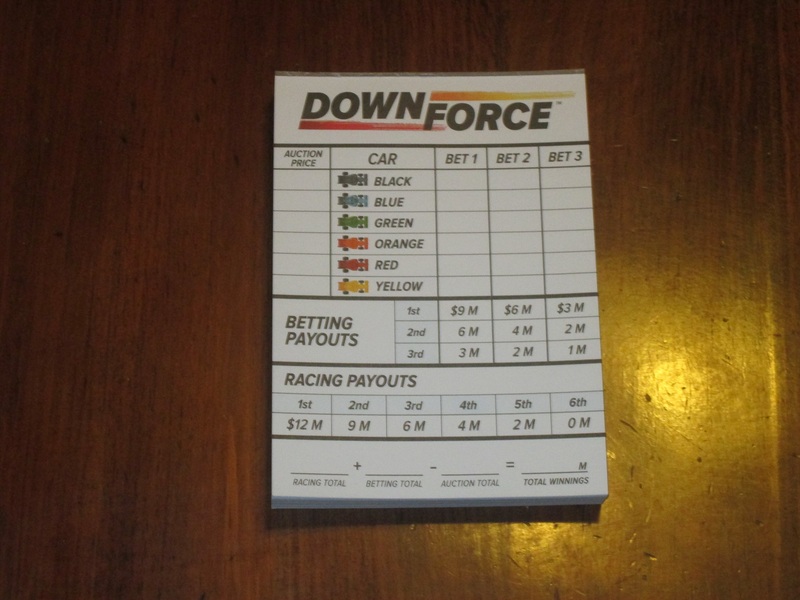 Downforce is a racing, betting, and hand management game for two to six players. Players bid on cars, race them around the track, and bet on the winners. The player with the most money wins. 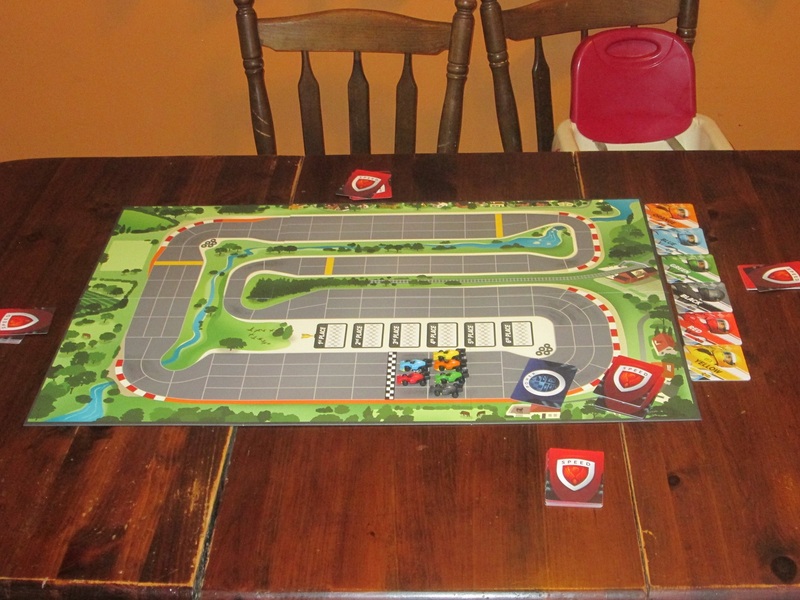 Downforce set up for four players. 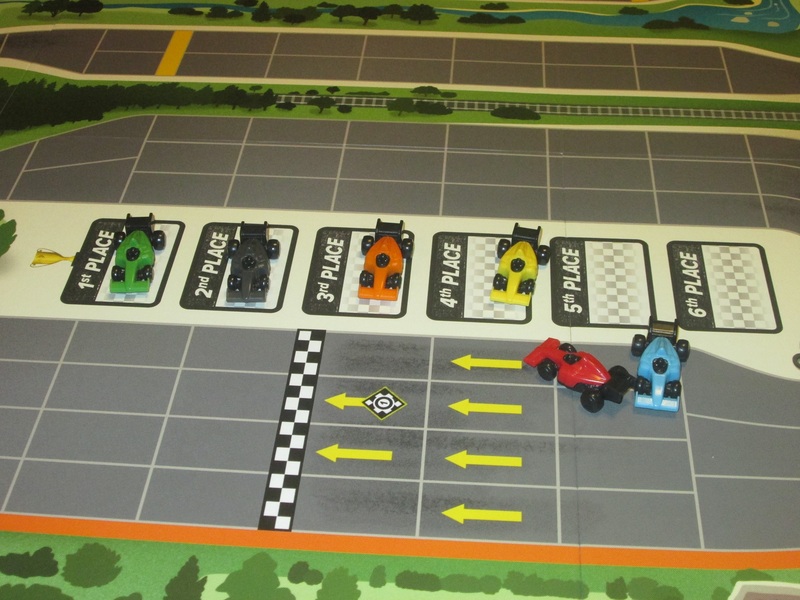 To begin, choose a side of the map to play on and randomly place the six cars on the starting spaces. Deal the deck of cards evenly among the players. Shuffle the six 8-speed cards and six special power cards. Each player receives a score sheet. The first phase of the game is the auction. One at a time, flip one 8-speed card and one special power card over. Players secretly and simultaneously choose a card from their hand with the matching color on it to bid for the car. The highest bidder gets the speed card and matching placard for the car won as well as the special power card. The bidder records the bid on the score sheet. Players may win multiple cars, but each player must have one car. You get the 8-speed cards for the cars you own. Use them wisely! After the auction comes the race. Starting with the player who won the car on the #1 space and proceeding clockwise, each player will play one speed card on their turn. 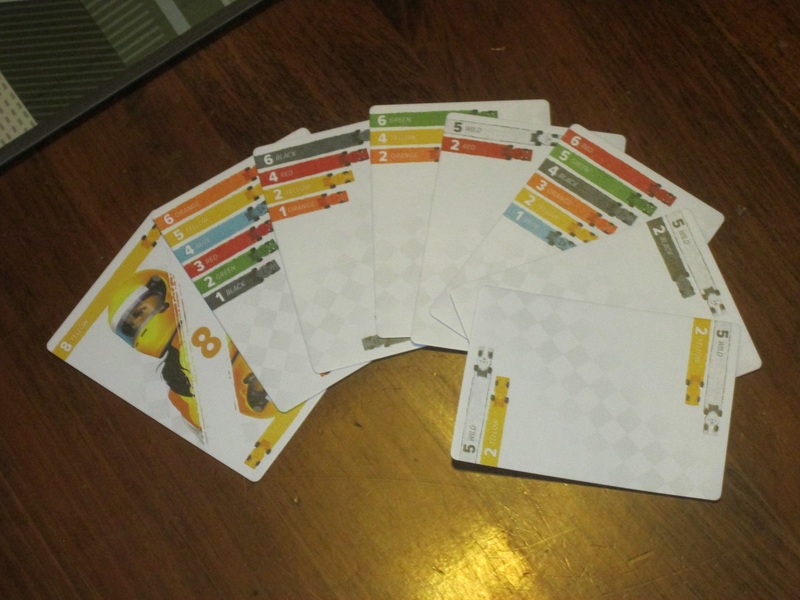 The card determines the order that cars move in as well as the number of spaces they move. The player who played the card moves each car. In order to move, the car must be able to move forward (including diagonally). If this is not possible, extra moves are lost. Yellow might be a good car to bid for. Each player will have one special power card, which can affect how cards move. Special power cards might let a player move their cars additional spaces, move a color twice, or ignore a color. 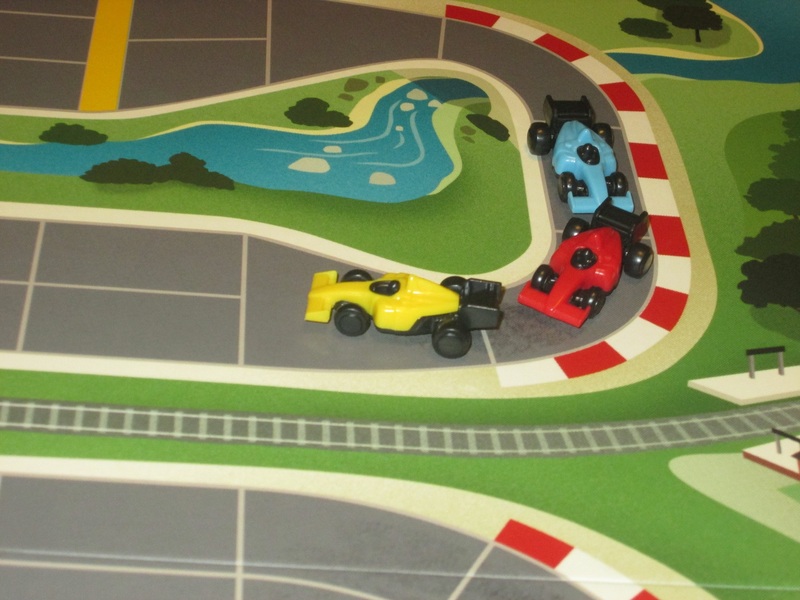 There are three yellow lines on the track, and the first time each line is crossed, players will check which car they think will win on their betting sheets, which will pay out at the end of the round if that car finishes first, second, or third. Whenever a yellow line is crossed for the first time, players place their bets. There are three yellow lines on each track. 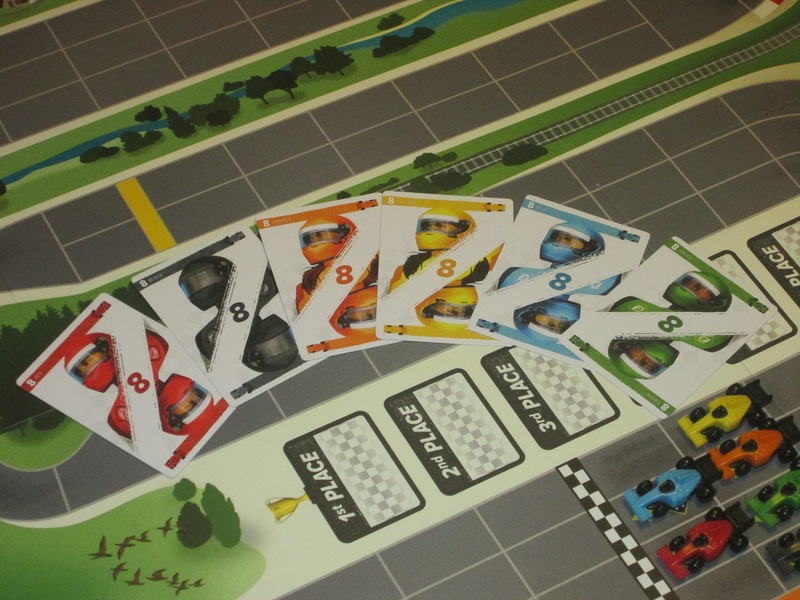 When all of a player’s cars have crossed the finish line, that player discards any remaining cards. 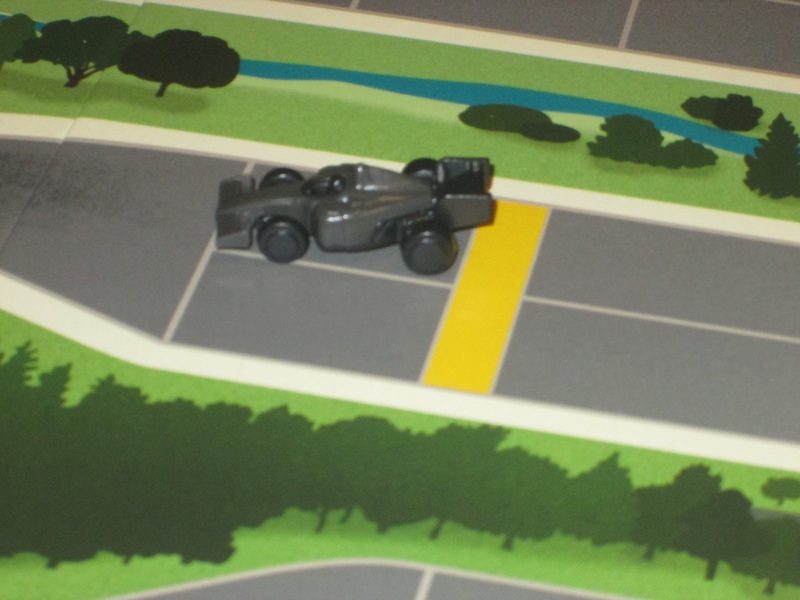 The round ends when either all cars have crossed the finish line or there are cars that can no longer move (because cards have been exhausted). Players earn money for the position of their cars and the accuracy of their bets and subtract the amount they paid for their cars. The player with the most money wins. 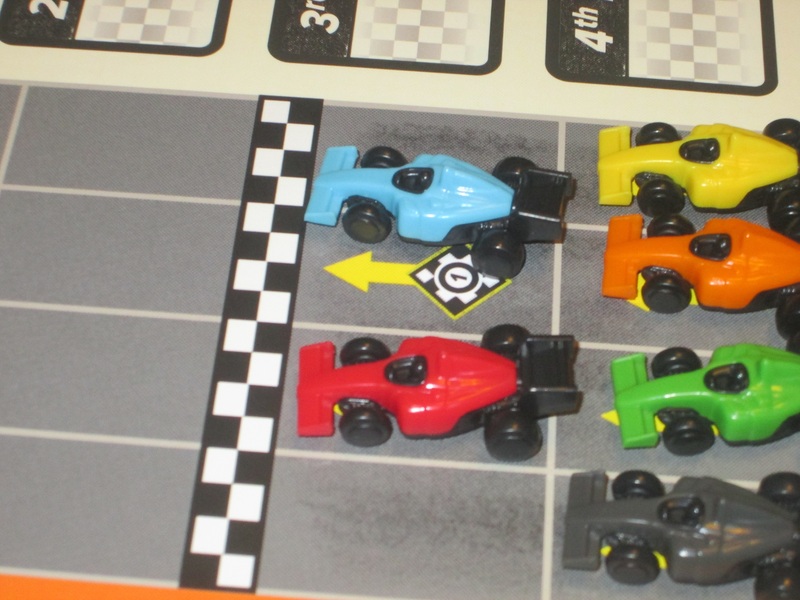 Downforce comes with several rules variants. 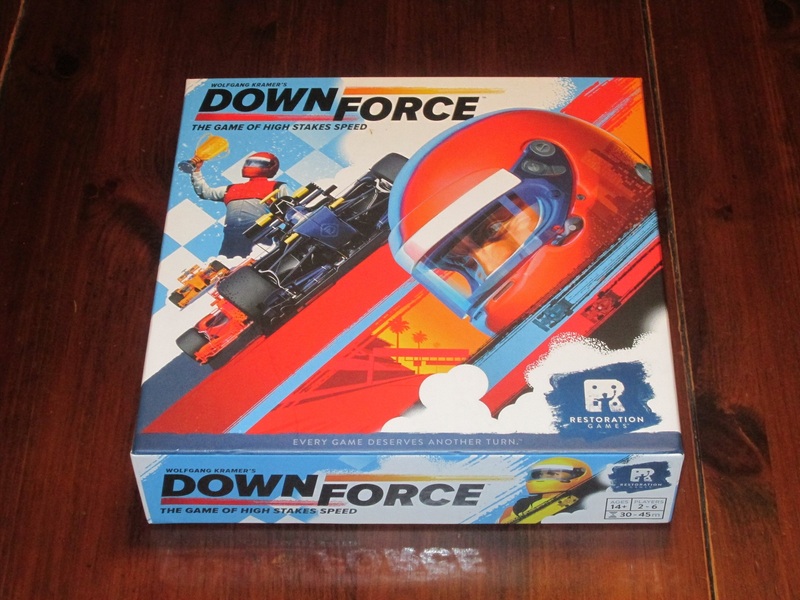 Downforce is one of three launch games from Restoration Games, and if it is any indication of their project, I’m fully on board with their slogan that “every game deserves another turn.” Downforce is terrific. 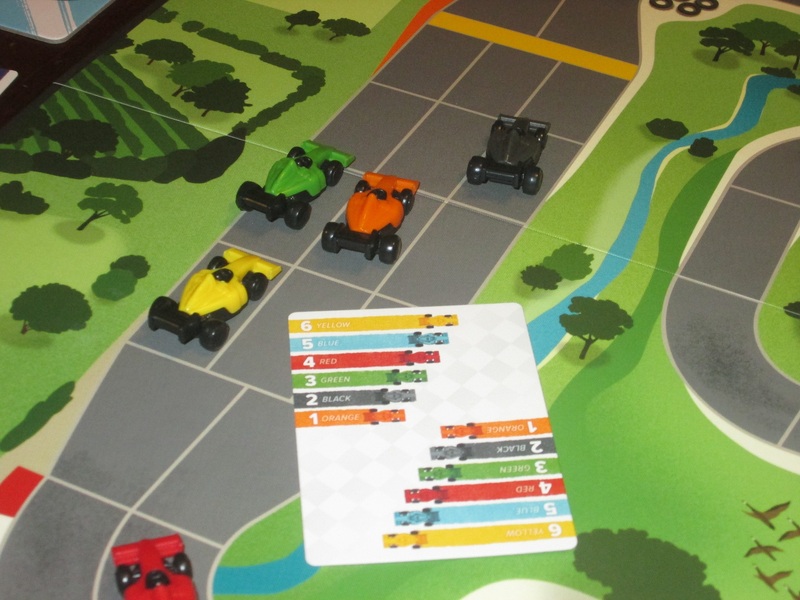 Downforce comes with a double-sided map board, and each map is distinct. When I looked at the game and introduced it to my friends, I think everyone’s reaction was the same. “Where does this fit? We already love Winner’s Circle.” Winner’s Circle and Downforce are both betting and racing games where players bid on and heavily influence the outcome of a race, and Winner’s Circle is a favorite among my gaming groups. While the conceit is similar on paper, the games are very different, such that there’s a place for both in my collection. An example of a hand of speed cards. What makes Downforce special is the strategic nature of it. Each player has a hand of cards, and they get to see these cards at the start of the race. If a player has a lot of cards that move one car better than another, it makes sense to bid higher in order to own that car. Or a player might have cards that work better with a certain power, so when that power turns up from the deck, it’s time to bid high. Rather than in Winner’s Circle, where players’ bets (which happen before the race) in many ways determine how they race and where anything can happen during the race (depending on what is rolled), here players’ knowledge of what cards they have affect which cars to buy. The racing tactics matter in Downforce, and there are several choke points on each map. I don’t want to oversell the strategy here, because there are still lots of fun and interesting tactics in the game. For starters, the layout of the race map matters, and matters a great deal. Each of the two maps has several choke points where only one car can make it through the curve. So even if you have high movement cards for your car, if you can’t move through the choke points, these cards are useless. Players have to balance a long-term view of the race with what opportunities are immediately before them to put the cars they care about in the lead. It may also involve helping another car–just to get it out of your way–in order to advance your own interest. I really like this. Players record their bets on individual score sheets. These are nice, although I wish they were double-sided. But Downforce is more than just a game of racing your car around a track; there’s also a benefit to betting correctly on the outcome. While bets can’t salvage poor racing, they do give players an opportunity to climb out of a points deficit, especially if they bet wisely. This means that players may do better advancing cars they’ve bet on than their own cars, depending on the situation around the track. The varying investment that each player has in the different cars elevates this above a straight racing game. Errr… Looks like yellow isn’t moving this turn. The spite factor isn’t huge, but it is there in Downforce. 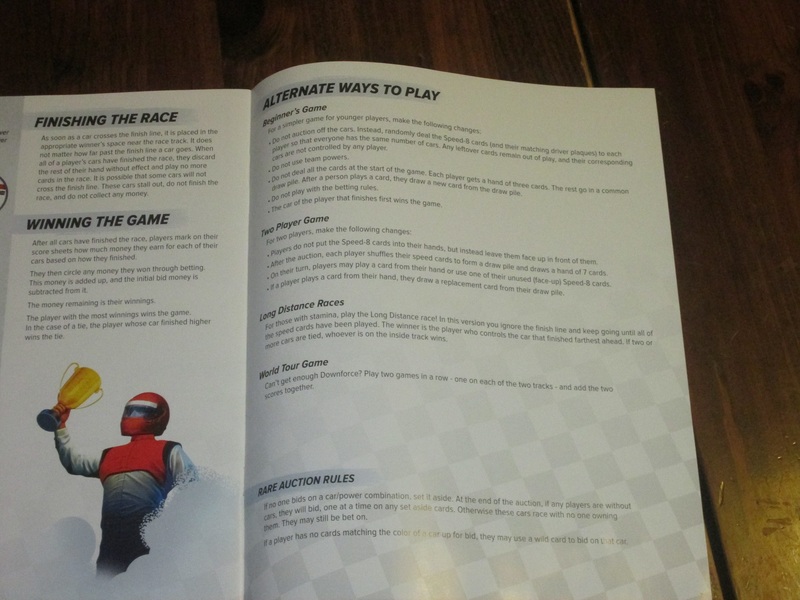 The racing, however, is still the key selling point here, because it is interesting. The idea that most cards move multiple cars and have to follow a specific order is a good one, and it makes the game thinkier than it first appears. With the full deck distributed for each race, it means that no matter which car you have, other players will have cards that benefit you, and you will have cards that benefit them. The chief decision point is using the cards you have to benefit yourself more than the other players. Because each card moves multiple cars, it also means that there’s not a great way to plan what you’ll do before your turn rolls around. Each turn you must read the board afresh and see if there’s a way to put your cars (owned and bet on) in the best position. Improving the tactics here is that the player who plays the card gets to move each car. Since a car must be able to move forward in order to move, it’s possible to box cars in through shrewd moves, even if choke points are far off. This is one of the best aspects of Downforce, although some may find it too mean. Downforce is not at all multiplayer solitaire. It’s a race, and it gives me the same adrenaline rush as playing a racing video game of trying to block competitors and rush ahead at just the right moment. 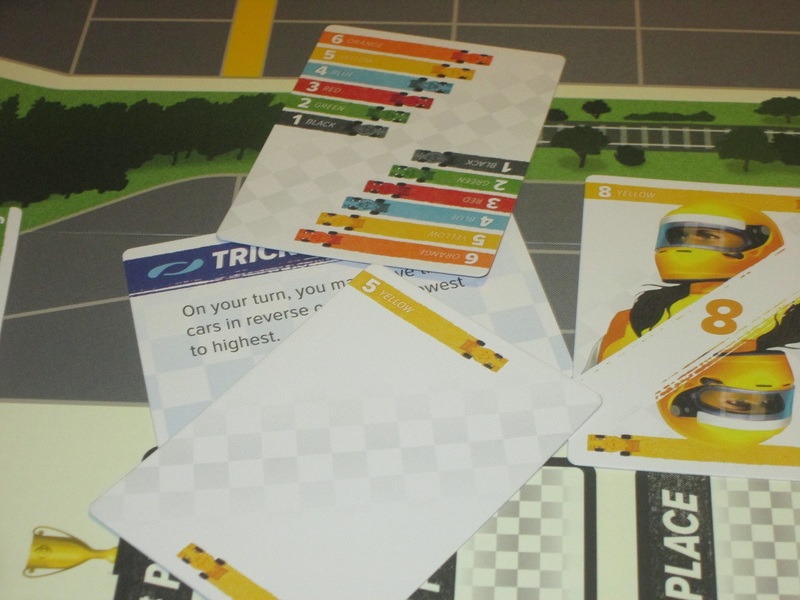 Downforce comes with six special power cards that break the rules of the game in some way. These are a nice addition to the game. Another elevating aspect of Downforce is the special power cards. 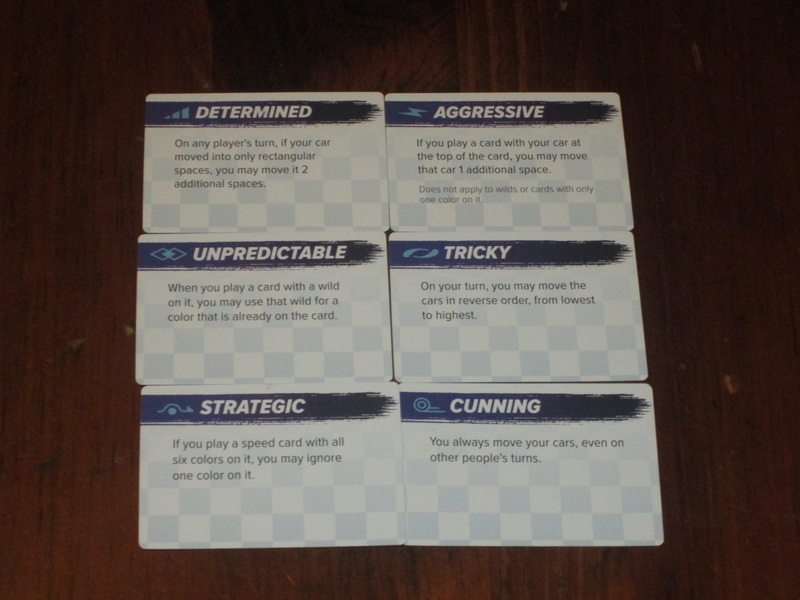 There are six special power cards in each game, one for each car, and they break the rules of the game in interesting ways. With one power, you can call out a wild color for a car already pictured on the card. With another, you can ignore one color when playing a card showing all six colors. Another power puts you in complete control of your cars, even on other players’ turns. Some cards let you move extra spaces if conditions are met or to move cars in reverse order of what’s shown on the card. These are all small boosts, and while some might seem better than others on paper, they can all be huge boons depending on the situation. Like most other aspects of the game, Downforce is about recognizing opportunities and exploiting them. One of the most exciting things about Downforce is the prospect of expansion. The game is dynamic enough that there should be enough replayability out of the box: your hand of cards and what you do with it will change each game, as will the combinations of cars and powers. 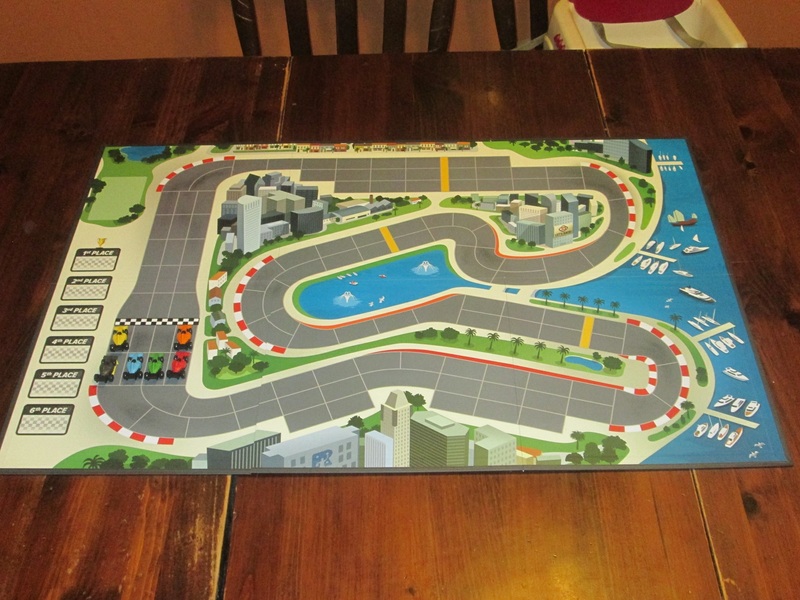 However, more track boards (and making a full race circuit) would give this game even more wheels. As it stands, it’s a great game for lunchtime or for a lighter game night; with multiple tracks forming a racing circuit, I could see this becoming the main attraction for a game night. If cars don’t cross the finish line, they don’t place on the final score table. I’ve played the game with three, four, five, and six players now, and while the game is good with three and four, it is fantastic with five and six. Because the full deck of cards is distributed each game, with more players, there is less certainty (there’s also less possibility of owning more than one car). This focuses the game in a way that, for my tastes, makes it even more interesting. That’s not to say that the game is bad with fewer players–I’d still gladly play this with three of four (I’d probably choose something else with just two)–I just like the tension of the larger game because you won’t have all the cards you need and have to rely on other players to move your car. The auction is blind and can be tense. As with all games, you need to know your audience with Downforce. For one thing, the hand management puzzle can be a little thinky, and players who must find the optimum solution can slow down this game that really does have a need for speed. It’s considerably more fun when it stays moving. To combat this, I encourage quick play. I’d also like to reiterate that Downforce is a very interactive game that at times can be downright spiteful. Because cars don’t move if they can’t move forward, positioning cars in the worst way when it is your turn can make other players unhappy. To me, the schadenfreude is part of the appeal of Downforce, even when I’m on the receiving end, but in at least one of my games, there were players who took it personally. This is not a friendly Euro of detached competition; you are trying to win, and doing so will usually mean making the other players lose. To me, this isn’t out of hand–it’s rarely advantageous to harm someone else while not helping yourself–but it is an aspect of the game. The player who owns the car on the 1 space goes first. The components here are excellent. 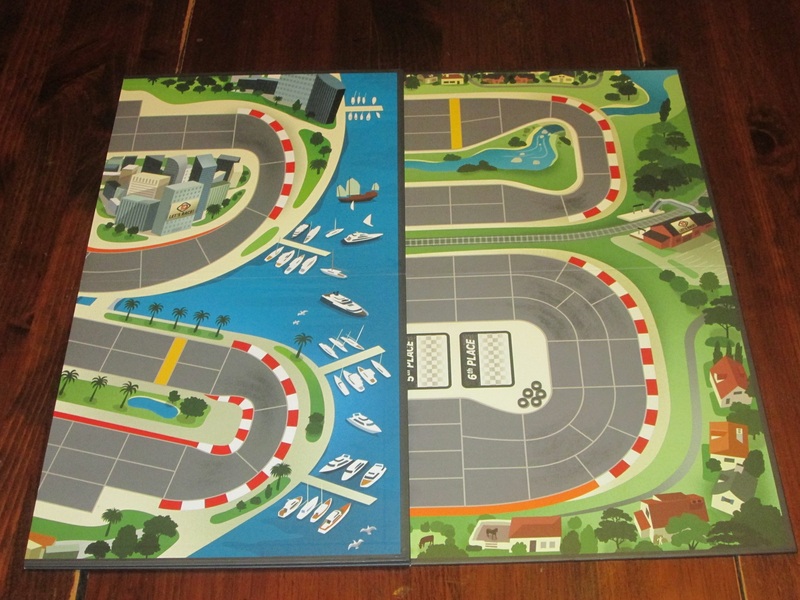 The map board is large and colorful, and the cars are clearly distinguishable on the board. The cards are easy to read and on nice linen stock. I like that the rules have provisions for edge cases but try to channel players along the path of least resistance. This is a family game, after all, and the rules are super simple to digest and teach. The rules include several variants as well, which should encourage players to tinker and find the flavor of Downforce that they like best. I do wish the betting sheets were double-sided (I’m a product of reduce, reuse, recycle indoctrination from my elementary school), but this is a minor quibble, especially considering that the Restoration Games app promises to have a digital scoresheet for players to use if they feel so inclined (the app says “coming soon” as of September 2017). The history of Downforce. This is a nice touch. 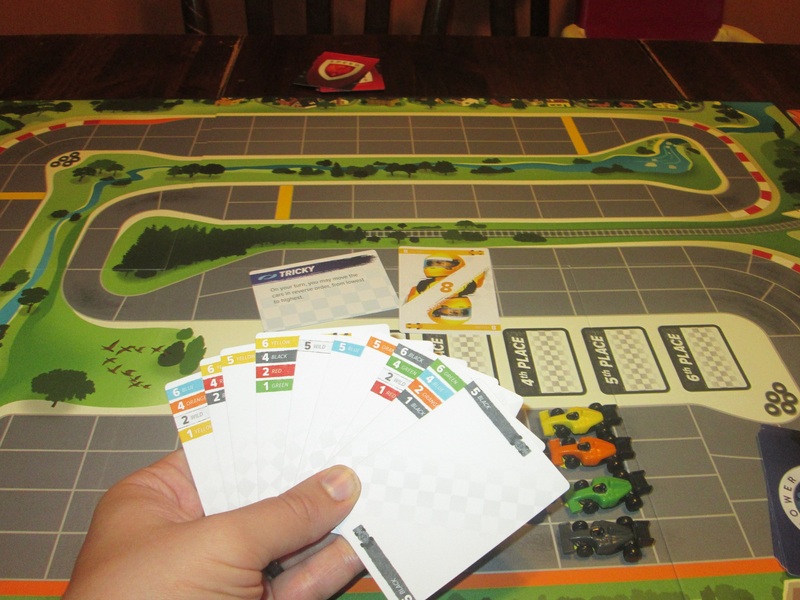 Downforce is decidedly a family game in that it has simple rules, so players who will only play long or complex games might not care for what’s on offer here. However, in my groups, played with rookies and veterans alike, almost everyone has enjoyed this. There are enough hand management decisions to make players feel at least somewhat in control of their destinies, but there’s enough that’s outside of players’ control to keep it light. While the decisions on offer here won’t be for every group, they should appeal to most, which should keep Downforce fresh in your collection. This game deserved a fresh coat of paint, and I’m glad to have discovered it, even this long after its initial release. 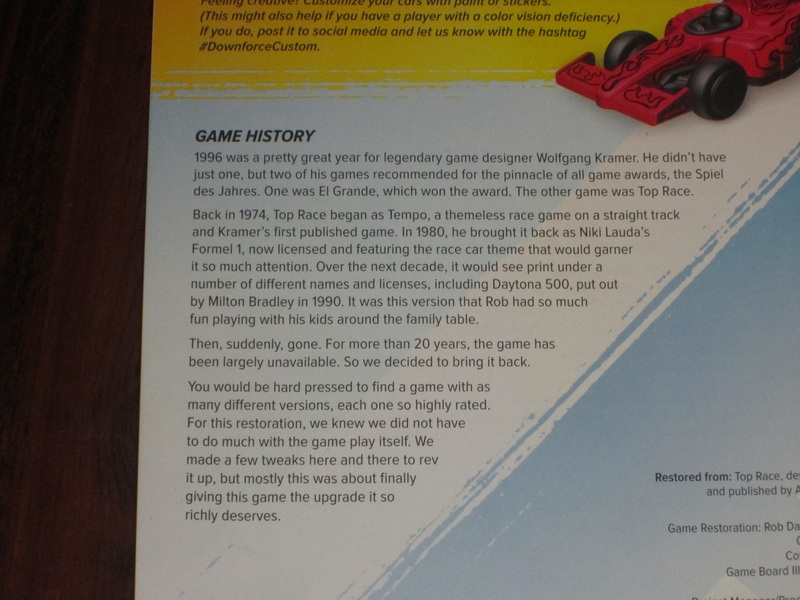 iSlaytheDragon would like to thank Restoration Games for providing us a copy of Downforce for review.